The positioning of your feet can affect the health, comfort and performance of your entire body. When you walk, you put the force of as much as five times your body weight on each foot. If your feet aren’t absorbing that shock or redistributing it properly, you can develop back issues. Muscles in the spine can spasm, become inflamed and fatigued trying to absorb the shock. SOLE custom moldable orthotic insoles are designed to improve alignment and provide the support you need to reduce back pain and prevent further injury. When there is an underlying foot posture or positioning issue (such as overpronation or flattening of the arches), this rotation of your leg bones can become excessive, leading to altered lower limb and pelvic biomechanics which increases the risk of injury throughout the body. Over time the repetitive strain on your body from poor alignment causes not only back pain but a host of other orthopedic ailments such as shin splints, plantar fasciitis, Achilles tendonitis, Iliotibial band syndrome and other issues. 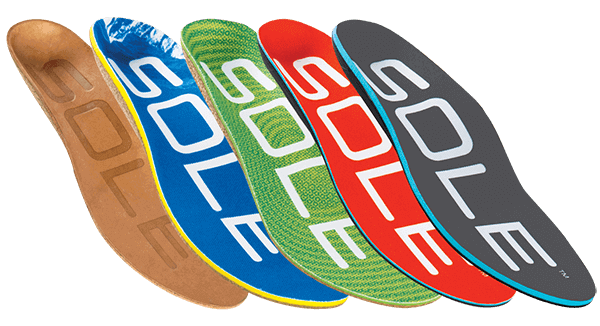 The orthopedic shape and customization of SOLE’s footbeds provide the neutralized alignment and industry-leading shock absorption you need to reduce back pain, prevent injury and put your best foot forward. 12 hours on my feet running around a very busy ER and no more back/foot pain. I’ve tried many pairs of insoles over the last 20+ years but these are by far the best. I was starting to get plantar fasciitis, bought these my feet stopped hurting. Then I noticed that my lower back wasn’t hurting as much. Now I have no more back pain in part due to improved posture when standing. Being pain-free and able to work is worth every penny. SOLE footbeds are absolutely amazing! I have had 3 back surgeries in the past 5 years and my physical therapist recommended them. After healing from surgery, I bought these footbeds and since wearing them my back is staying strong. I’m currently a proud member of the armed forces and in the army I spend a lot of my time on my feet. SOLE inserts give added comfort to combat boots and make taking care of my feet so much easier. My feet and knees and back are much more supported now, I will never use any insert again except SOLE. I have recommended SOLE to my friends and and other soldiers as well, my wife even bought a couple of pair and instantly loved them. Thanks for a wonderful product and keep up the great work.